The first successful test flight of a high altitude solar plane was conducted by Facebook as the company plans to provide internet to 4 billion people in remote parts of the world. “After two years of engineering, I’m proud to announce the successful first flight of Aquila — the solar-powered plane we designed to beam internet to remote parts of the world. Here’s the video from our first flight,” Facebook CEO Mark Zuckerberg said. The plane, Aquila drone, which at cruising speed uses same wattage as three hairdyrers, uses lasers to beam internet to remote regions. It has the wingspan of an airliner but weighs less than a car. When cruising it consumes just 5,000 watts – the same as three hairdryers or a powerful microwave. According to Zuckeberg, the challenges include, weight, power, control, speed, altitude, load, and communications. 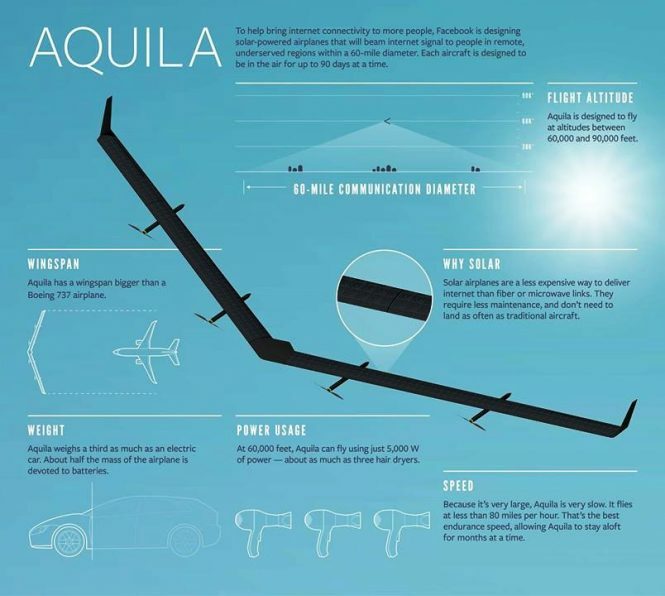 “Over the next year we’re going to keep testing Aquila — flying higher and longer, and adding more planes and payloads. It’s all part of our mission to connect the world and help more of the 4 billion people who are not online access all the opportunities of the internet,” Zuckerberg added.